Ephesians 6:10-12 (10) Finally, my brethren, be strong in the Lord, and in the power of his might. (11) Put on the whole armour of God, that ye may be able to stand against the wiles of the devil. 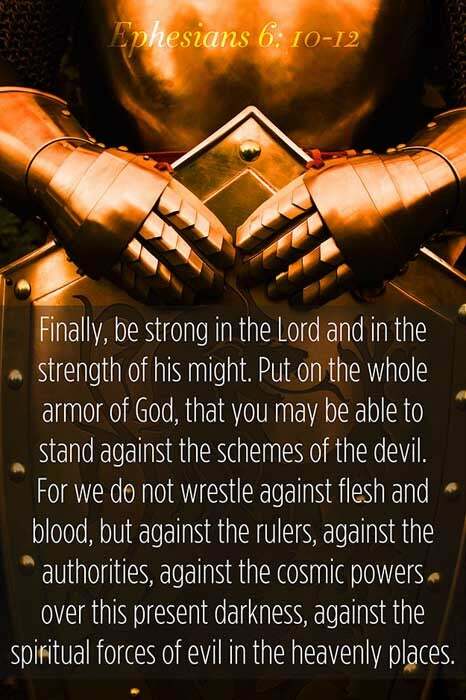 (12) For we wrestle not against flesh and blood, but against principalities, against powers, against the rulers of the darkness of this world, against spiritual wickedness in high places. Christ did not tell His disciples that their work would be easy. He showed them the vast confederacy of evil arrayed against them. They would have to fight “against principalities, against powers, against the rulers of the darkness of this world, against spiritual wickedness in high places.” Ephesians 6:12. But they would not be left to fight alone. He assured them that He would be with them; and that if they would go forth in faith, they should move under the shield of Omnipotence. He bade them be brave and strong; for One mightier than angels would be in their ranks—the General of the armies of heaven. He made full provision for the prosecution of their work and took upon Himself the responsibility of its success. So long as they obeyed His word, and worked in connection with Him, they could not fail. Go to all nations, He bade them. Go to the farthest part of the habitable globe and be assured that My presence will be with you even there. Labor in faith and confidence; for the time will never come when I will forsake you. I will be with you always, helping you to perform your duty, guiding, comforting, sanctifying, sustaining you, giving you success in speaking words that shall draw the attention of others to heaven.